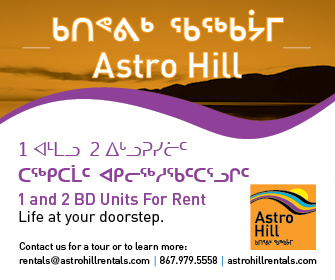 Standing near the banks of the Sylvia Grinnell River just outside of Iqaluit, archaeologist Tim Rast says he’s still amazed by the four-millennia story of civilization told in the ancient homesteads and earth surrounding the “Crystal II” historic site. “We’ve got continuous occupation here for probably 3,500 years or more. People have been coming back to this spot continuously,” he said from a hill overlooking the ruins of an ancient Thule homestead, Aug. 19. Crystal II was the first site where archaeologists could differentiate between the Thule, ancestors of the modern Inuit, and the earlier Dorset culture. And further research discovered an earlier, pre-Dorset culture, lived there as well. Rast, alongside fellow researchers Laurie White and Brendan Griebel, are wrapping up a 10-day survey for a proposed project by the Inuit Heritage Trust to reconstruct an ancient Thule homestead at the site. The archaeologists dug test pits and collected samples that will determine how much time IHT needs to conserve and clear an area at the site for the new Thule dwelling. Griebel said the proposed Thule house project will be an important cultural and educational tool for Inuit to learn about their past. “It will let people visualize what’s going on in the past and interact with it and take part in rebuilding it every summer and fall,” he said. The research team collected nearly 50 artifacts — bones, stone flakes, wood and tools — from one-square-metre test pits dug around four ancient Thule foundations discovered at the site. “If this was a site that was chosen for the Thule house, what would it take to clear the area so that you could safely construct it without damaging the archaeology?” Rast said. That’s a question they are now asking themselves. But the research team has a secondary goal this summer as well: piecing together decades of fractured archaeological work at the site that’s never been compiled in one place. It’s the “archaeology of archaeology” Rast said. Work on the site first began in the early 1940’s when American soldiers stationed at the so-called “Crystal II” airbase dug up the first foundations. But the soldiers didn’t follow any scientific method during those digs and displaced much of the site, as well as left it unearthed and exposed to the elements, Rast said. Since that time, archaeologists have tried to piece together what was at the site before it was dug up. Henry Collins, the first trained archaeologist to visit the site, arrived a few years after the first dig, but his surviving records are not detailed. In the 1960s and 1970s, Moreau Maxwell completed the last extensive excavation at the site. But there’s confusion over which Thule houses are identified between Collins and Maxwell. Nobody has tried to piece it all together, until now. “Despite people working here for over 70 years, nobody’s ever drawn a map,” Rast said. When the team presents IHT with their completed report, Rast says they will estimate two options for the heritage organization to move forward with the Thule house construction at Crystal II. The first will estimate how much time it will take to build the house over an existing foundation after conserving the remaining historical artifacts. The second option will propose an adjacent area for the Thule house near the historic site on land with fewer historical deposits. If IHT decides neither option is viable, the Thule house will be relocated to the Apex trail, near the old cemetery in Iqaluit, on land that contains no historical deposits. “[The Apex trail is] basically archaeologically clear. That would be an easy one to do. Here [at Crystal II], it would be more complex. It might take a summer or two to clear,” Rast said. IHT board members are expected to discuss the options later this year, with a planned start date for the Thule house sometime in 2017.